Sand County Foundation, in partnership with the Oklahoma Cattlemen’s Association, Oklahoma Farming and Ranching Foundation, ITC Holdings Corp. and The Samuel Roberts Noble Foundation, is proud to announce Emmons Farm as the recipient for the inaugural Oklahoma Leopold Conservation Award®, which honors Oklahoma landowner achievement in voluntary stewardship and management of natural resources. Emmons Farm is owned and managed by Jimmy Emmons and his family. The farm was converted to no-till in 1995, and Jimmy later went a few steps further and adopted crop rotations, cover crops and planned grazing management to decrease soil erosion from water and wind, and increase water infiltration of the soil. In addition to conventional soil testing, Jimmy uses specialized soil and plant tissue testing to determine soil fertility. This helps him reduce fertilizer application rates by crediting the system for nutrients supplied by soil microbes. 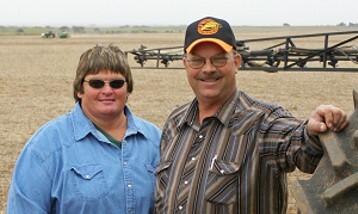 Jimmy was one of the first farmers in his area to experiment with pollinator strips and companion crops. Both have helped create habitat for beneficial insects, which help control crop pests without the need for additional insecticide. Although his initial experimental plots had slightly less yield than average for the area, his net profit was greater since the yield decrease and cover crop costs were less than what the insecticide expense would have been. The $10,000 award, and a crystal depicting Aldo Leopold will be presented to the Emmons family on Earth Day at the Oklahoma State Capitol. “We are pleased to support Sand County Foundation to bring the Leopold Conservation Award to Oklahoma and congratulate the Emmons Farm on their achievements in landowner stewardship,” said Donna Zalewski, ITC Holdings Corp. Director of Local Government, Community Affairs and Philanthropy. The Leopold Conservation Award in Oklahoma is made possible thanks to the generous contributions from the Oklahoma Cattlemen’s Association, Oklahoma Farming and Ranching Foundation, ITC Holdings Corp., and Noble Research Institute.